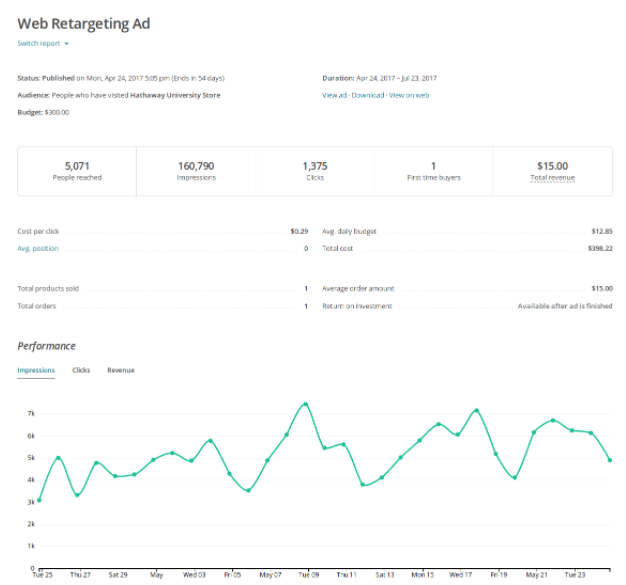 Reports help you measure engagement and audience response for your retargeting ad, including views, clicks, and return on investment (ROI). In this article, you'll learn about your retargeting ad report. To view your report, navigate to the Reports section of your Mailchimp account. Click the name of your ad to continue. After your audience is built and your ad is active, it'll take a little while to see significant results on your report—usually about a month or so. Retargeting is a long-term strategy, and this is totally normal. Here's what you'll find in your ad report, and what the terms mean. The number of times your ad was displayed. If a viewer sees your ad 3 times, that's 1 person reached and 3 impressions. Connect your store or site to Mailchimp, so you can create custom pop-up forms, retargeting ads, and more. In this step-by-step tutorial, you'll learn how to start or cancel Google remarketing ads.